Would you know what to do if you were faced with a cougar? Cougars have been sighted through the Steelhead area, so be aware and be prepared. Read the following information to learn more about cougars and the precautions you should take in cougar country. If you meet a cougar . . .
Stay calm and keep the cougar in view. Pick up children immediately. Back away slowly, ensuring that the animal has a clear avenue of escape. Make yourself look as large as possible. Never run or turn your back on a cougar. If the cat shows intense interest or follows you, respond aggressively. Maintain eye contact with the cat, show your teeth and make loud noises. Arm yourself with rocks or sticks as weapons. Crouch down as little as possible when picking things up off the ground. If the cougar attacks, fight back. Keep the animal in front of you at all times. Convince the cougar you are a threat, not prey. Use anything you can as a weapon. Focus your attack on the cougar’s face and eyes. The above tips come from BC Parks resource ‘Bears and Cougars’. Click here to view the more of the information they provide. For additional information about Cougars, click here (Wild Safe BC). Mysterious, enigmatic, secretive – the cougar weaves in and out of myth and legend like a wisp of smoke. 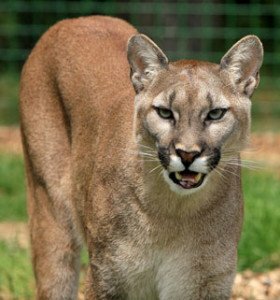 Mountain lion, puma, catamount; many names from many places, all belonging to the cat known in the Pacific Northwest as cougar. To scientists it is know as Felis concolor, or “cat of single colour.” In American folklore, it is the ghost walker, ghost of the wilderness. Larger than the other two North American wild cats – the lynx and the bobcat – an adult cougar may weigh from 85 to 180 pounds. It may reach six to eight feet in length including the thick, expressive, dark-tipped tail which makes up about one-third of it’s total length. A cougar’s coat is typically a tawny colour, shading into gray in the northern part of the species’ range. The muzzle and chest are white, with a dark triangular marking on each side of the mouth. Cougars are primarily nocturnal creatures and even when active in daylight, they are secretive and rarely seen. They favour dense forest and brush that provides good stalking cover while hunting. Cougars also take advantage of steep canyons and rock outcroppings to remain hidden. A cougar is a solitary animal, coming together with another cougar only for mating. Females first breed at 18 to 24 months of age, and litters are born at two- to three-year intervals thereafter. Gestation is 92 days. Cubs are born with blue eyes and a spotted coat; the spots gradually fade and disappear completely by age two. Cubs stay with their mother for up to two years. She is a playful and loving parent, teaching her young what they need to know to survive. The cougar patrols a territory of 125 to 175 square miles, with females’ ranges a bit smaller than males’. Territories are defended by mutual avoidance rather than direct confrontation. A cougar marks its boundaries with “scrapes” consisting of a mound of dirt and forest litter, urine and dung. These scrapes serve to warn away other cougars of the same gender, though the ranges of females often overlap males’ ranges. Cougars eat everything from mice to elk but deer are their preferred prey. The largest cat in North America, cougars once ranged across the continent. Due to aggressive predator control programs and habitat loss, they are now scarce in much of their former range. Though they continue to suffer from habitat loss due to human intrusion, the cougar is not considered a threatened or endangered species. Life in the wild is dangerous for a cougar. Free-ranging cougars seldom live for more than 13 years. They must find food, mates, a territory, and avoid hunters and other hazards. Outside of national parks, the cougar is listed as a game animal in Washington and in most states, so hunting is allowed according to state game regulations. Hunting is not allowed in most unity of the National Park System. A cougar has all of the grace and playfulness of house cat; it purrs and has a taste for catnip. Our familiarity with domestic cats can lead to some misconceptions about cougars, however. They are wild animals and must be respected as such. Although few people ever see this elusive cat in the wild, sightings and encounters in the national parks have increased in recent years. Cougars are entirely capable of lethal attacks on people, and predatory attacks by cougars have occurred across the western U.S. and southwestern Canada over at least the last 50 years. Some incidents occur when people behave in a manner that resembles a cougar’s normal prey. Expanding development and subdivisions into cougar habitat, particularly in areas with high deer populations, and residents who leave pet food or small pets or other animals outdoors at night seem to be factors that contribute to increased frequency of cougar attacks. When you are in backcountry, you are in cougar habitat. Keep this in mind and follow some basic rules. Never approach a cougar, especially a feeding one. Cougars are unpredictable individuals, but will normally avoid a confrontation. If you encounter a cougar, be sure to give it a way out. Keep children close to you while hiking, and do not allow them to run ahead or lag behind on the trail. Pick them up if you see fresh sign of cougar. Hiking in a small group is best. Particularly in areas where cougars have been sighted, avoid hiking alone. Jogging is not recommended. People running or moving rapidly may be at higher risk. A walking stick makes a useful weapon in the event of an encounter. Immediately pick up small children. If you were sitting or bending over, stand upright. Spread your arms, open your coat – try to look as large as possible. Maintain eye contact with the cougar, and attempt to slowly back away. Be assertive. If approached, wave your arms, shout and throw sticks or rocks at it. If attacked, fight back aggressively. An attack from a cougar is an unlikely event and by taking these precautions, you can reduce the chances even further. By taking care, you will help enable all of us to continue to share America’s wildlands with these magnificent animals. If by some rare chance, you meet the ghost cat of the wilderness, consider it a gift.